FILE - President Donald Trump listens to a question during an interview in the Oval Office of the White House, in Washington, Oct. 16, 2018. President Donald Trump said in comments broadcast Sunday that U.S. military intervention in Venezuela is "an option." 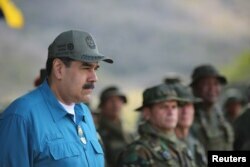 Trump declined, in an interview with CBS News, to give any specifics of what might prompt him to order U.S. forces into the South American country as the U.S. and other countries ramp up pressure to oust President Nicolas Maduro and support opposition leader Juan Guaido as the country's interim president. Trump said that "a number of months ago," he turned down Maduro's request to meet with him, because "we're very far along in the process...really democracy in action" for Guaido to assume power. The United States and other countries have recognized Guaido as the acting Venezuelan president. "I decided at the time, "no" because so many really horrible things have been happening in Venezuela when you look at that country," Trump said of possible talks with Maduro. "That was the wealthiest country of all in that part of the world which is a very important part of the world," Trump said in the interview that was taped Friday. "And now you look at the poverty and you look at the anguish and you look at the crime and you look at all of the things happening. So, I think the process is playing out - very, very big tremendous protests." Trump's comments came as the late Sunday deadline approached for an ultimatum from several European countries for Maduro's government to call new presidential elections. Austrian Chancellor Sebastian Kurz said on Twitter he talked with Guaido, telling him "he has our full support to restore democracy." Kurz said that "should Maduro not respond to the EU's call for free & fair presidential elections, we will acknowledge and support Juan Guaido as President ad interim…." Maduro has called for early National Assembly elections. Guaido, as head of Congress, has standing to claim he is the country's legitimate leader. Two military leaders and an ambassador defected Saturday from Maduro's government and instead recognized Guaido as the acting president. Early Saturday, General Francisco Yanez called on other members of the military to defect as he announced his own defection in a social media video. He rejected Maduro's "dictatorial" authority and recognized Guaido as the acting president. Guaido said in an interview with VOA Noticias he has offered "amnesty and guarantees" to high-ranking military officials as part of a broader effort to get "this usurpation to end." Jonathan Velasco, Venezuela's ambassador in Iraq, also joined the defectors Saturday. Thousands of Guaido's supporters, carrying flags and blowing horns, converged on a handful of locations around Caracas in support of his call for early elections and the establishment of a transitional government amid mounting global pressure for Maduro to step down. 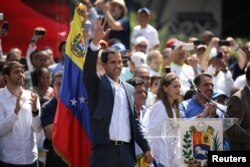 Guaido arrived at one of the rallies with his wife, Fabiana, and was quickly surrounded by exuberant supporters. 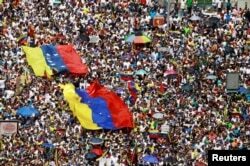 Pro-Maduro demonstrators took to the streets on the western side of Caracas to celebrate the 20th anniversary of the Bolivarian revolution that led to the rise of socialist Hugo Chavez, Maduro's deceased predecessor. Maduro addressed the crowd, the first time he has appeared at a public rally since August 4. Opposition supporters take part in a rally against Venezuelan President Nicolas Maduro's government in Caracas, Venezuela, Feb. 2, 2019. Maduro called for parliamentary elections earlier than planned, repeated that he is the country's legitimate president and told the crowd, "I am very ashamed to see this group of opposition coup perpetrators" take orders from Washington.